In the Registration Settings (Convention tools > Registration > Settings) you can open, suspend, or close badge and ticket sales. 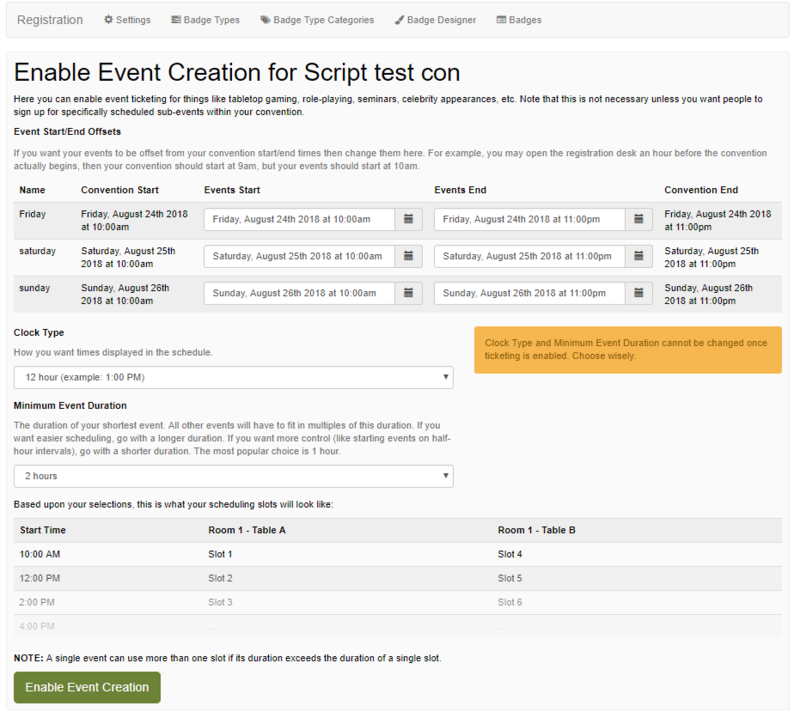 Once you click on “Enable Event Management”, you will be taken to a screen where you will determine the clock type you want to use for your convention and the Minimum Event Duration. Important: Event duration will set the length of your shortest event. You will not be able to change this setting after this point, so please make sure you know how long you want your schedule blocks to be. All other events will have to fit in multiples of this duration. If you want easier scheduling, go with a longer duration. If you want more control (like starting events on half-hour intervals), go with a shorter duration. The most popular choice is 1 hour. After you enable Event Creation, you can go back to Registration Settings (Convention tools > Registration > Settings), and you will be able to edit additional fields that allow you to determine the settings for selling tickets. Generic tickets are tickets that can be used for any event (in place of tickets for specific events). Most conventions don't use these, so the default setting is to have these disabled. 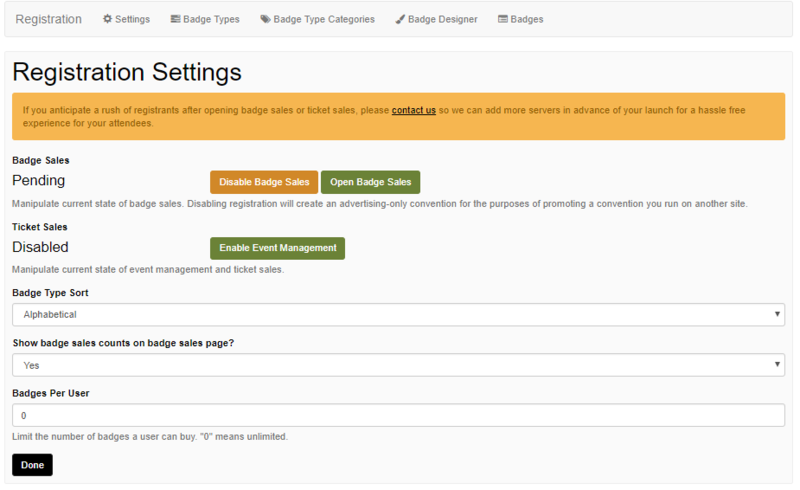 Badge Type Sort defines the order in which the badges are displayed on the Get Your Badge page. Show badge sales counts determines whether or not attendees will be able to see how many of a badge type have been sold already on the “Get Your Badge” page. Badges Per User allows you to limit the number of badges a user can purchase (for example, it would limit the number of badges a user can purchase for friends or family members). Tickets Per Event Per Badge limits the number of tickets a user can purchase per event per badge. Use E-Tickets? allows you to determine whether you'd like to collect tickets on users' phones, rather than printing and collecting paper tickets for each event. 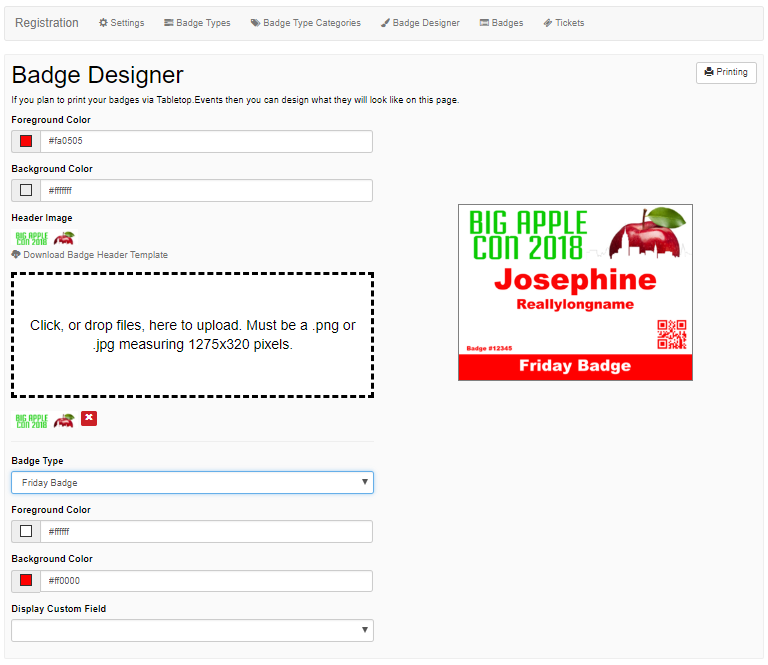 Under Badge Types (Convention tools > Registration > Badge Types), you'll create all of the badge types you wish to include at your convention. For example, you may have a badge for each day, a full-weekend badge, a VIG badge, etc. To create a badge, enter the name for the badge and click on “Create”. You'll then be able to enter all the details for that badge. 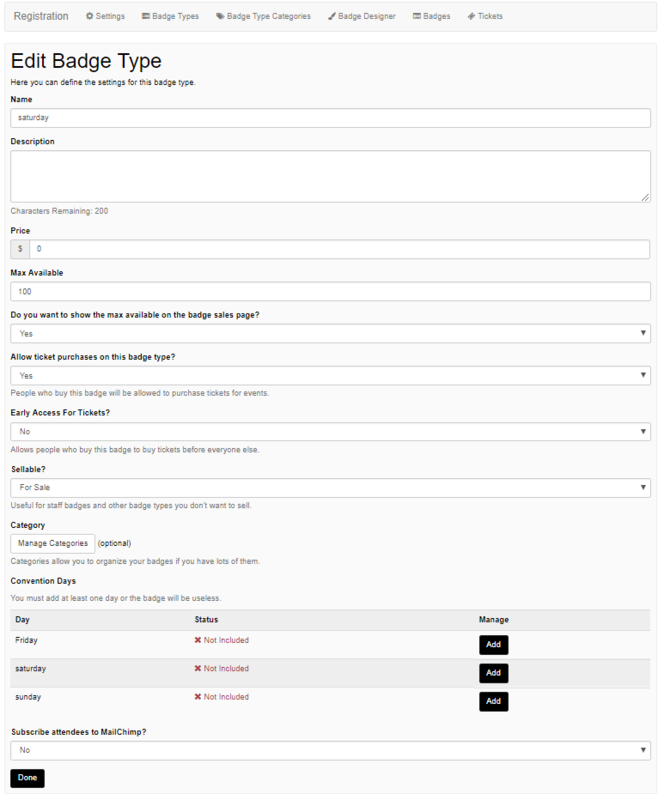 You'll use the Description field to explain details about that badge to your attendees. The Max Available field limits the number of badges of that type that can be sold for the convention. You can choose whether or not to display this value on the “Get Your Badge” page. You can also allow or disallow ticket purchases for each badge type, and determine whether early access to tickets will be available. In the Sellable? field, you can designate whether the badge is for sale, hidden from the public, or not for sale. Badge categories are an optional way of organizing badges, which we will discuss in a moment. Convention Days determine which days of the convention the badge grants access to. Event Groups are a way to organize events beyond just what type they are. Some examples would be celebrity events, charity events, or featured events. By adding an event group to a badge, you can limit how many tickets from a particular event group can be purchased by an attendee with this badge. Subscribe attendees to MailChimp? determines whether the attendees who have this badge will be automatically subscribed to updates about your convention via MailChimp. The Custom Fields section allows you to create fields for this badge only to collect additional information from your attendees. For example, you may have a badge type that comes with a free t-shirt, and wish to collect size information. Or, you may use this field as a way to have your attendees agree to the terms of your convention (which could include being photographed, for example). If you select the “Agree to Terms” type, you can add a URL that leads to your terms, determine if agreeing to the terms is required to attend the convention, etc. Badge Type Categories are an optional way to organize your badges if your convention has a lot of different badge types. (Many conventions don't use badge type categories, but they are always available.) 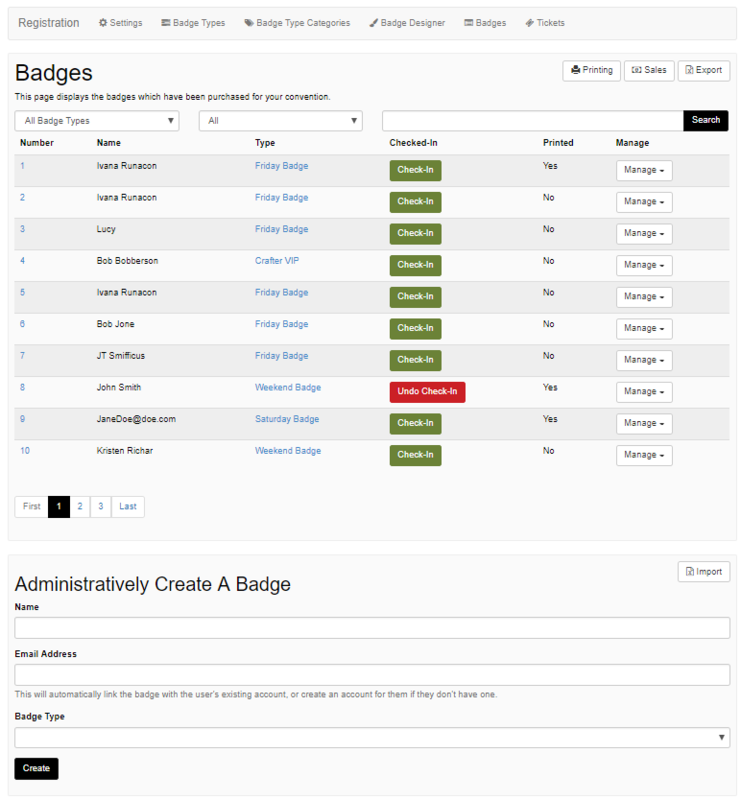 For example, if you offered a number of different types of badges for staff members, you could create a “Staff Member” badge category. The Badge Designer allows you to customize the look of your badges. You can select the Foreground and Background colors, by either entering the color value or using the color picker. The Badges page will show the badges which have been purchased for your convention. You can sort by a specific badge type, see badges that have been checked in or not checked in, or search for a specific name, number, etc. You can also administratively create a badge from this page (for example, for a special guest or staff member) by entering the attendee's name and e-mail address and selecting the badge type. When you click on “Create”, this badge will be automatically linked with the user's existing account if they have one, or create a new account for them if they do not. The attendee will receive an e-mail, asking them to set a password for their account. If you click on Sales, you can view the badge sales, overall and by badge type. 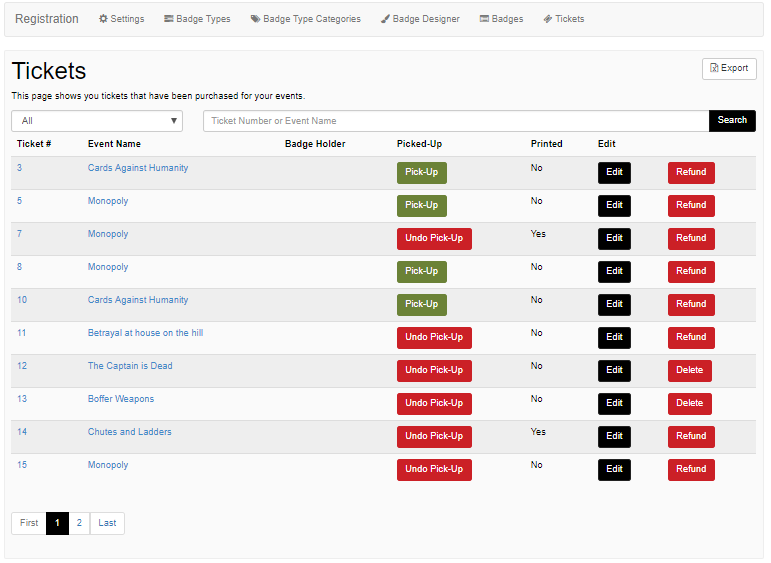 The Overview section shows how many badges have been checked-in, printed, sold, or administratively created, as well as how many badges are still in carts. If you are printing your badges and tickets yourself, you can do that from the Badges page. (You would need to export this information as a CSV file, then put that information into a template of your own creation.) If you click on Printing, you'll see instructions for order badges, badge paper, and badge holders/lanyards, as well as the options to export your badges and tickets into CSV files. On the Tickets page, you can view the tickets that have been sold, open ticket sales, and export the ticket information as a CSV file. You can also edit the existing tickets, indicate that tickets have been picked up by attendees (by clicking on Pick-Up), or refund tickets.